I had assumed that I could stick to the same type of training (monitoring my confidence and capability each week, adjusting as necessary) for Phase Two. But by Wednesday this week, I realised that would not be the case. The thing I slowly discovered and accepted is, Phase One is over. It’s gone. I have confirmed that I have what it takes to do a triathlon: now I have to get better at it. Not to say I’ve turned my back on Phase One – on the contrary, everything I learned and experienced is propelling me forward, keeping me upright and traveling in the right direction. That took a couple of days to sink in. Because I loved doing the Bribie Island Triathlon Short Course; it was a brilliant race with a great atmosphere. I highly recommend giving one of the Bribie races a go if you are local because the organisation is top-class, the volunteers are all wonderful and it is a great race for spectators, because it is non-stop action. I got a bit stuck because there is another Bribie race coming up in March (it is a 4-race series every year) and for the 48 hours after completing my race, I wondered whether I should sign up for Bribie Tri in March and count it as part of my training for the bigger races. 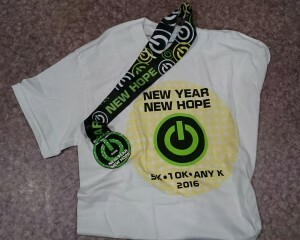 It was so fun, and I know I can do it now! But deep down I knew I was doing my usual trick of hanging on to the less scary, more comfortable stuff, whilst trying to pretend the frightening reality of the future may never eventuate. Sticking my head in the sand, as usual. Yes – I was trying to deny the frightening reality of The Straddie Salute. There are less than 12 weeks to go, and it entails a swim more than double the distance of Bribie, and a run almost 3 times as far. I am scared, plain and simple. I thought I’d feel so confident and buoyed up, raring to go after Bribie. In fact that feeling only lasted for about a day. So after a bit of soul-searching I decided not do to another race until Straddie, because it is time for me to embrace this new fear, and start a new training plan. 1. I don’t think I can swim 750 metres in the ocean. 2. I definitely haven’t run 8km yet. Oh, and don’t mention the fact that, at the end of Phase 2, Phase 3 awaits. So maybe three things haunt me. Oh, Stage one, how I miss thee. So, a dilemma. What to do when you have a goal destination, with no idea how to get there? Answer: Draw a map. Find some landmarks to look for on the way. Estimate the speed at which you need to travel to get there on time. 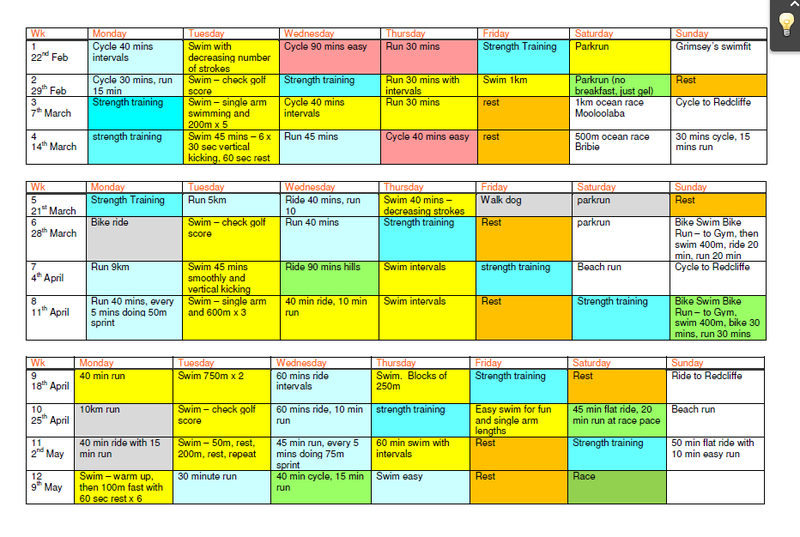 So I have come up with a rough training calendar for the next 12 weeks! I have never done anything like this before, so please be warned: If you found this whilst trying to come up with your own training plan, feel free to completely ignore it all because I have precisely zero idea what I am doing. My plan was to focus on where I need to be the week before ‘The Taper’ and work back to today from there. Based on the fears above, I decided to mainly focus on running and swimming sessions. 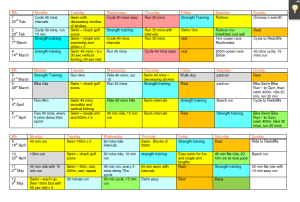 I also incorporated some sessions I already have booked in – like another Grimsey’s clinic. And I don’t like to swim on Mondays (no real reason, I just don’t like it) so I tried not to put in any swimming training on Mondays! Please note that I could (should?) have engaged some kind of triathlon coach to help me with this – lots of other people do, with huge success. It’s what someone smart would do. If you’ve read this blog, you’ll know I am not smart. And unfortunately I also have that peculiar human quality of wanting to do exactly the opposite of what anyone tells me to do. Tri coach: Come on, Lauren, two more minutes at this pace! Me: I quit triathlon forever and I will never run again. So I don’t think a coach is on my horizon any time soon. Plus, I am really tight with money. Plus (this is hard to admit) I like to think I am a genius who knows more than anyone else. The grey days are public holidays (so the gym will be shut) and the pink days are tricky in terms of my work. Light green days are days to test out energy gels – obviously the dark green day is race day. 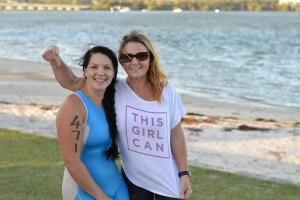 This entry was posted in Everything Else and tagged bribie, coach, ego, newbie, straddie salute, strategy, training, triathlon. Bookmark the permalink. Always another challenge just ahead.